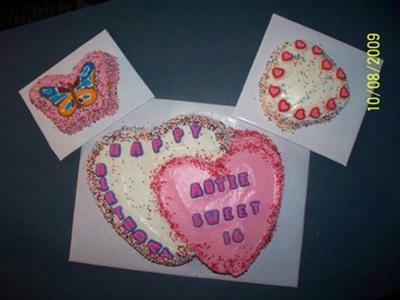 This sweet sixteen cake is for my daughter. She just wanted plain strawberry cake with strawberry 'canned' icing. I used a double heart shaped pan. I also used a single heart shaped pan and a small butterfly pan. I used the store bought canned icing she likes and did them in white and strawberry. I added sprinkles and candy letters. They look very, delicious. I'll bet she looooooooved them.